Lynda.com is a fantastic training resource for web development, with strong roots in the past, but also relentlessly up-to-date. Lynda.com includes a lot of the spicy stuff, in an easy-to-grasp format. Lynda.com was founded in 1995, when web development was still quite new. Lynda.com specialized in niche, but important, topics such as using HTML and CSS with different browsers. It grew into a comprehensive site that currently costs $25 a month for a regular membership that gives you access to all its resources. Many of you may be new to web development, and need a resource just for vocabulary and basic concepts. Or you may be one of those interesting people who know a lot about one area, such as CSS, but not related areas. In either case (that is, unless you’re already pretty well-versed) you need an introduction to know what to do on a more advanced training site like Lynda.com! Lynda.com has close to 2,000 training courses and covers all experience levels, with strong instructors and excellent multimedia quality. You can learn everything you need to know about most topics from Lynda.com. There is exactly one topic that is superlatively well-covered by information available on the web, and that’s web development. If you are determined, you can learn just about everything you need to know about web development by searching online. But you’ll waste a lot of time and take in a lot of useless and out-of-date information and approaches along with the good stuff. So seriously consider using structured resources for much of your learning, such as Lynda.com, and then using web searches to find specific tips and information in a hurry. 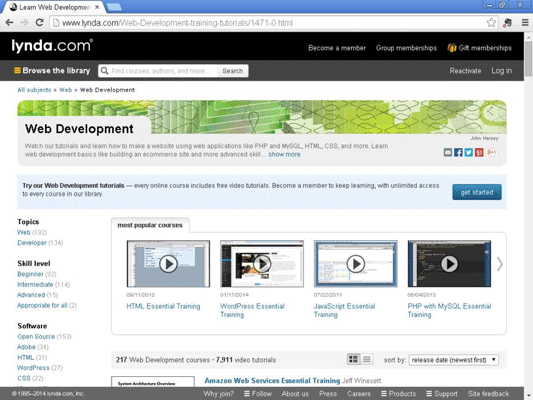 Check out the web development home page of Lynda.com, which is really the core expertise of the site. Note that the page includes programming using languages such as PHP and MySQL as well as web development standards like HTML and CSS. HTML Essential Training: HyperText Markup Language (HTML) is the core of web development, and it’s where Lynda.com’s popular courses begin. WordPress Essential Training: WordPress is a web development environment and content management system (CMS) that began life as a blogging tool. It’s very popular, and Lynda.com covers WordPress thoroughly. PHP with MySQL Essential Training: PHP is a “real” programming language and MySQL is a standard for database access. So this course teaches people how to make more capable websites that interact with real data, making the site more powerful. Creating a Responsive Web Design: It’s not enough to know how to make things happen; you have to have a feeling for what you might want to do with all that power. This course helps you give users the most functionality with the least strain through your site.